I've included here some magnificent examples of rhythm and motion in the garden. I hope you will easily grasp how you can use this principle of repetition in your home garden. To review the basics of rhythm and motion in the garden be sure to visit the Rhythm and Motion in Garden Design page. 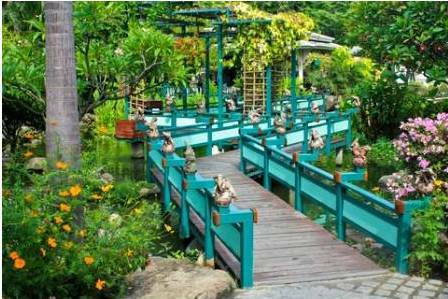 Pay close attention to the various uses of repetition that help create the illusion of motion in these gardens. These examples of rhythm and motion in the garden should demonstrate how easily repetition can be used to create a strong sense of motion. I think you will easily see that the principles demonstrated in these examples of rhythm and motion apply to any garden style. Notice how dynamic every one of these gardens is! Not a single static note in any of them! 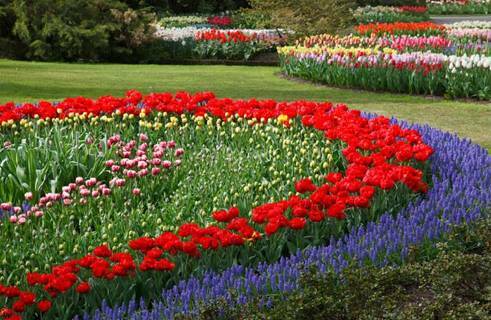 Repeated Line and Color are the backbone of this tulip garden. 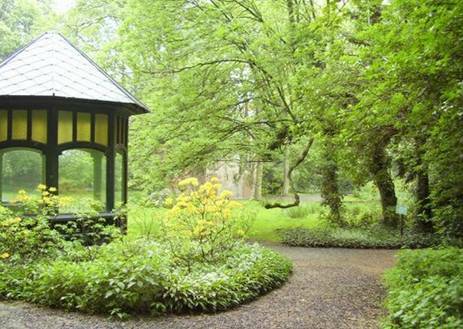 Note the sweeping movement of your eye as you follow the curved line of this garden. Repeated Line and Shape create a sense of rhythm and movement in this monochromatic garden scheme. This is another of the examples of rhythm and motion that demonstrates how these key principles of repetition, rhythm and motion apply to any garden space. Don’t you just want to follow that path and see where it goes? 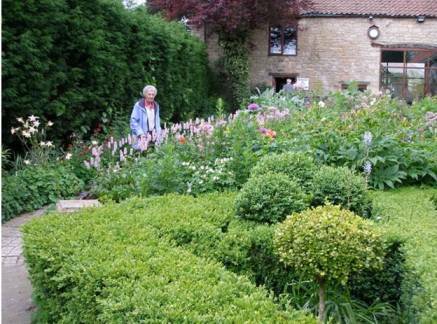 Here is an English Perennial Garden built upon both repeated line and texture. The sweep of the path to the manor house, the ascending heights of the perennials used as the repeated curved line of the garden itself sweeps toward the house, and the progressive advance of repeated texture, which starts as small leaves toward the forefront of the photo and progresses to the larger leaved specimen at the rear of the garden, all work together to create a example of strong rhythm and motion. The Oriental themed garden below also has a very strong sense of rhythm and motion introduced primarily by the use of repeated line. 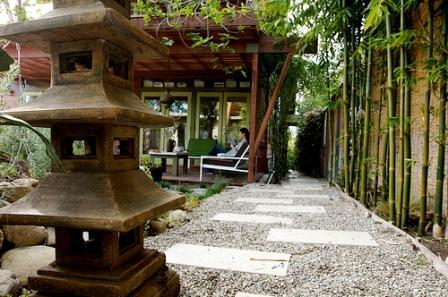 The staggered stepping stones and the line of bamboo lead the eye back toward a covered porch. The rhythmic lines of the oriental sculpture toward the front of the photo give an additional vertical twist to the sense of rhythm and motion in this garden. A residential garden gets a real boost to the sense of rhythm and motion through the use of repeated diagonal line, texture and color. The zig zagged cement patio, the triangular shaped garden bed, and the diagonal line of the wood planter at the rear of this garden all add a real pizzazz to the very small space. Repeated vertical lines in the garden sculpture and the forms and textures of the garden plants lend an additional sense of rhythm to the space. Repeated color at the front of the garden echoes the line of the triangular spaces in the garden. And finally, in the bamboo fencing, repeated vertical lines reinforce the vertical elements. What an exciting treatment of such a diminutive space! 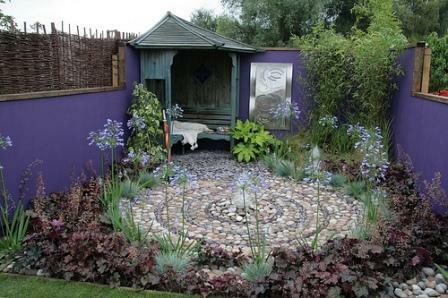 Last, but not least, is a garden space created for the Sandringham Flower Show in the United Kingdom. Every element of this garden repeats a form, a texture, or a color. The circle shaped patio in the center has its own rhythm and motion apart from the rest of the garden, but this theme is dramatically repeated by the use of deep purple coral bells. 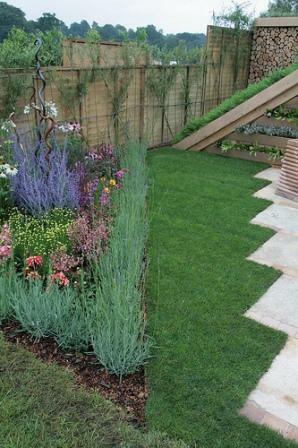 Vertical lines are repeated throughout the garden in the form of grass-like plantings, which repeat the purple blue colors of the walls. These gardens dramatically characterize the spectacular effects which can be achieved when introducing the concepts of rhythm and motion into your garden. Good design takes advantage of these rhythmic variations, and in the process guarantees an active and dynamic garden experience.